PRODUCT DESCRIPTION: Line voltage new construction recessed lighting housing; 120V 50W MR16 GU10. Ceiling cut-out: 2 13/16". 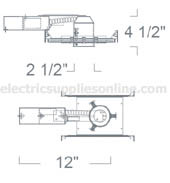 HOUSING: Pre-wired .05� baked enamel 1-piece drawn steel housing adjusts up to 1-1/4� ceiling thickness. Integral thermal protector to guard against improper lamping and installation. Trim is secured with torsion wing springs. MOUNTING: Housing suitable for existing or new construction installations, supplied with high tension remodeling clips, designed to secure the housing to an existing sheet rock ceiling for fast and easy installation. SOCKET: Standard porcelain GU10 "Twist & Lock" socket with high temperature leads. JUNCTION BOX: 16 gauge pre-wired aluminum Junction Box, suitable for through branch wiring for a maximum of (4)#12 AWG wires. Furnished with (2) 3/4" knock-outs. Screw-in or out covers for easy access and ground wire. Equipped with safety standard fitting for flexconduit.